Well this has been the first full day of plenary sessions at the 231st meeting of the American Astronomical Society (AAS). There has already been some really interesting presentations and I find I'm having a harder time to summarize what I heard, but here goes. The AAS 231 was held outside of Washington DC, actually at National Harbor in Maryland. There were way too many sessions to choose from, but my approach was to attend all of the plenary sessions and one special session dealing with Pan-STARRS telescope in Hawaii and how its publicly available data is being used and can be accessed by the public and citizen scientists and a short summary of those sessions will be presented. Suzi Gezari, U of Maryland, discussed how Pan-STARRS was used to study Tidal Disruption Events (TDE). Remember a TDE is when a star gets too close to a black hole and is pulled apart and pulled in to the black which results in a big flare of radiation. The study combined data from GALEX and Pan-STARRS. One of the first TDEs they studied was PS1-10ej, which is shown in the light curve graph below. Theoretical models derived using these curves can provide estimates of the mass of the black hole. Adam Riess, John Hopkins University, made a presentation entitled, "A new measurement of the expansion rate of the universe", to a nearly standing room only ballroom. Riess won the Nobel Prize for his earlier work identifying the acceleration of the universe by using supernovas as standard candles. 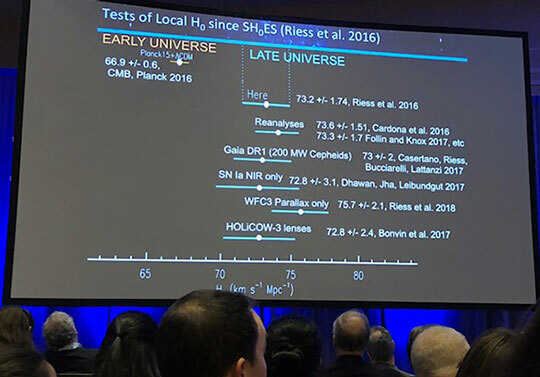 This presentation discussed some of the latest findings of the SHOES project, which has the goal of reducing the uncertainty in Hubble constant estimates from current 2.4% to 1% or lower. A key part of the presentation was a comparison of the tension between two key projects that have made estimates of the Hubble constant. First the Cosmic Microwave Background studies have fixed Hubble constant at 66.9 +/- 0.6 and the supernova study fixes it at 73.2 +/- 1.74. 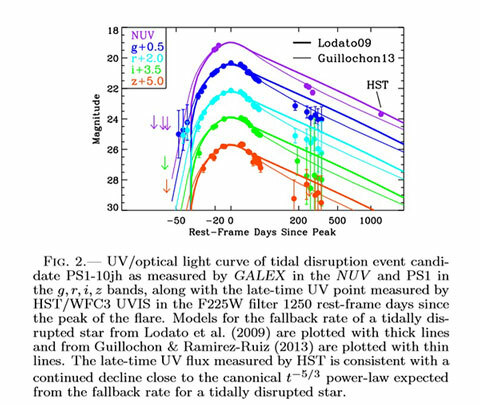 Riess went over the various studies that contributed to both types of estimates and attributed the new HST scanning spatially scanning technique as a key improvement in gathering more and additional supernova light curve data. He said the increased accuracy from Gaia and other sources is helping reduce the error in the distance measurement estimates. He also said that the difference between these two estimates might come down to some effect and function of the red shift at which these measurements are made. The supernova study uses single digit redshifts and the CMB data was set in place somewhere near redshift = 1300. More data and reduced error estimates will help resolve which estimate is better. Natalie Hinkel, VDA Fellow at Vanderbuilt U, presented a review of the stellar abundance database and the Hypathia Catalog. She pointed out the importance of elements heavier than hydrogen. Astronomers think of metals as anything heavier than Hydrogen/Helium, but other interdisciplinary scientists, like geologists and biologists, want to see more data on the heavy metals, like carbon, iron, sodium and potassium and other elements found so necessary for life. The following table shows the current database for over 5000 stars and the abundances of heavy elements. She also argued for extending the definition of the habitable zone for exoplanets to go beyond just a consideration of the temperature required for liquid water, to include typical heavy elements, now thought necessary for life as we know it. Cayman Unterborn, Arizona State University, spoke as a geologist and how this concept of expanding the habitable zone to include the heavy elements for life also makes sense in terms of the possible geology of the exoplanet will have the right geochemistry to support the right exoplanet conditions, many of which are known on Earth to be necessary for life, such as plate tectonics and a magnetic field, might not be possible if the right combination of heavy elements are not found in the exoplanet. So, if an exoplanet is at the right distance from its sun to maintain liquid water, if the chemical composition of the expoplanet does not have the right combination of heavy elements, then these geological processes, like plate tectonics and magnetic field, might not be present and this would result in the exoplanet really being more likely than not in the uninhabitable zone. Nick Kaiser, winner of the RAS Medal Prize Lectureship, spoke on "The Effects of Non-linear Structure on Cosmological Observations." This issue is one that I was wondering about too. How is it that we know that the information we get about the structure of the universe, which we get primarily from light, has not itself been compromised by the structure of the universe interacting in a non-linear way. Ok, that is about it for this first day of AAS. This blog is very nice and you provide this content is very different. Your explanation style is very unique and I am waiting for your more details from your blog!! !